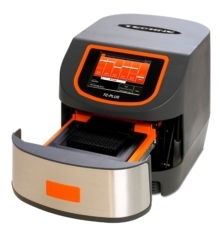 With one of the fastest aluminium blocks on the market, the Techne TC-Plus thermal cycler has been shown to contribute to significant savings in PCR reaction times by using faster ramp rates, modified programs and modified reaction mixes. According to Rob Skehens, Bibby Scientific Marketing Director, "The results in our new Application Note show that while the faster ramping of the TC-Plus alone gives significant time savings, modifying the program and changing to a fast PCR mix can shorten run times even further. If any resultant compromises in yield and sensitivity are unacceptable, some reaction optimisation may be needed."